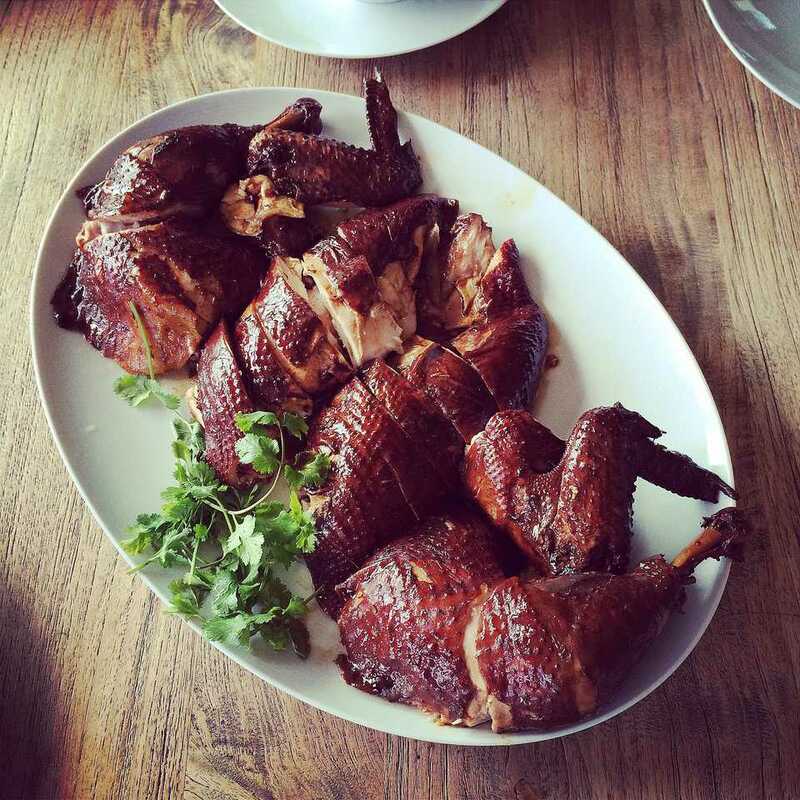 Smoked goose is an option for your Christmas goose or preparing this luscious bird year-round. Slow roasting at a low temperature is just what a goose needs to let the fat drain out so the dark meat isn't greasy. The smoking process also helps to make the meat tender and flavorful. Commercially-raised geese are very high in fat, and it takes a long smoking time of 30 minutes per pound to render that fat. Consider this when setting up your smoking time. You will need a pan in your smoker to catch the fat and drippings, which can be used for gravy. When buying a goose, aim for a precooked weight of 1 1/2 pounds per person. That may sound high, but with so much of the precooked weight being fat, the resulting amount of meat is much smaller. For the best-tasting bird, look for the smallest (and therefore the youngest) goose that can serve your gathering. Low-temperature smoking for the whole cooking time would result in a soft skin that isn't pleasant to eat and doesn't look great. It's best to roast the goose at 350 F in the final cooking phase to get a crisp, brown skin. Prepare the smoker for a cooking time of 30 minutes per pound. Wash the goose and pat it dry with paper towels. In a small bowl, mix the sage, celery salt, black pepper, and salt. Rub the seasoning mix over the inside and outside of the goose. After 1 hour, remove the cheesecloth. Baste the goose with juices from the pan and continue smoking and basting until the internal temperature reaches 145 F (63 C). To crisp and brown the skin, place your nearly cooked goose on the grill or in an oven at about 350 F, or if your smoker allows you to do so, raise the temperature to 350 F.
The goose is done when the temperature reaches 165 F (75 C). Remove the goose from the heat and allow it to rest for 20 minutes before carving. Carve the goose, serve and enjoy! Your smoked goose will be a great centerpiece for any family dinner or celebration. You can make gravy from the drippings to enjoy with mashed potatoes. Serve with your favorite roasted vegetables and dinner rolls. Refrigerate any leftovers to enjoy for up to four days. You can also freeze leftover smoked goose for two to three months. The drippings and rendered fat are also delicious to use when making potato dishes. Freeze them if you aren't going to use them immediately.